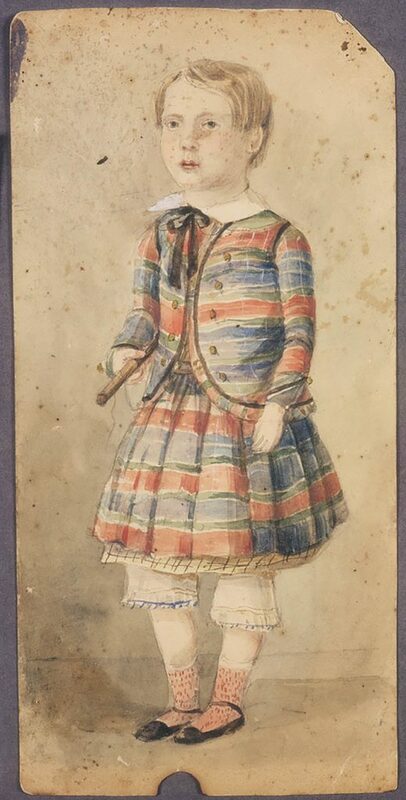 This finely-rendered left facing, full-length watercolour portrait shows young George Australia Garling, aged about 5, in a standing pose holding a telescope in his right hand. He wears a full-skirted, knee-length dress, typical attire for boys during their toilet training years, before they were breeched, ie. put into breeches or trousers, at about 5-6 years of age. George’s dress is made of a suitably jaunty red, blue and green striped fabric, worn with a white collar and black ribbon tie and a matching long-sleeved bolero, with ornamental gilt/brass bobble buttons and bands of dark braid or piping, the curved front edges and cuffs trimmed with self-fabric binding. His spreading skirts extend out over a white cotton petticoat and knickers with light-blue blanket-stitch embroidered trim, above short socks knitted in a red and white marled yarn and square-toed, black leather slippers with ankle straps. His short blonde hair has been brushed into a side parting, a useful indicator of gender in an era when all girls wore their hair with a centre parting. George Australia Garling (1846-1927) was the fifth son of Frederick Garling Jun. (1806-1873) and his wife Elizabeth nee Ward (1810-1880), in a family of eleven children (seven sons and four daughters). On Saturday last, the 10th instant, by Special Licence, at the Church of St Philip, Sydney, by the Rev. W. Cowper, Frederick Garling, jun. Esq. of the Customs to Elizabeth, eldest daughter of the late Lieutenant Ward of the 1st Regiment of Royals and niece to the late General Hawkshaw in the Hon. East India Company’s Service. Promoted to acting landing surveyor in 1847, Garling continued to work as a customs official for the rest of his career, based at Sydney’s Customs House. An entirely self-taught as an artist, most of Garling’s work was in watercolour and is generally unsigned. With only early mornings and weekends to spend on his painting and specializing, naturally enough, in marine subjects, he was regarded as one of Sydney’s most prolific marine painters, said to have painted every ship that entered Port Jackson during his lifetime. George Garling married Kate Elvina Wright at Murrurundi, NSW, on 27 Sep 1876. The couple is believed to have had a large family and newspaper reports stated that George worked as a station manager in New Zealand, where he lost a great deal of money. Returning to Australia, his last years were marred by a succession of larceny charges. He died at Waverley in 1927. POVERTY AND CRIME. METROPOLITAN QUARTER SESSIONS. SMH, Wed 30 Nov 1904. George Australia Garling, aged 53, and formerly a station manager, pleaded guilty to the theft, on October 6, of three watches, the property of H. R. Ward. Garling was employed by Ward, and pawned the watches for £5 13s for the sake, he said, of providing for his family, numbering 11. He had been unemployed for some months, and had had two operations performed on him in hospital recently. On his promising to make restitution, his Honour sentenced him to one month’s imprisonment, the sentence to be suspended on his own recognisance to be of good behaviour for 12 months. ‘Frederick Garling Drawn by his Ma’.